The trip will lead you to the most beautiful places of England with lots of 18th-century history. Belton House ranks no. 1, as you are very close to the movie action here. The rooms of the house featured in Pride & Prejudice (1995) include the Marble Hall, the Blue Bedroom, and the burr walnut bureau cabinet, upon which Darcy wrote his letter to Lizzie. Thus, many scenes depicting Mr Darcy’s emotional conflicts were shot here. Also have a look at the Ante Room where Lizzie plays the piano, and the Hondecoeter Room where Lady Catherine De Bourgh receives her guests. If you enjoy history, don’t miss the story how one of Belton House’s owners, the 6th Baron Brownlow, became entangled in the scandalous love affair of King Edward VIII and that woman, Wallis Simpson, in 1936. Stourhead is must-see for the fans of Keira Knightly and Matthew Macfadyen. Mind you, it is the garden that is important: The Temple of Apollo, set above the lake, was used as the location for Mr Darcy’s first proposal to Lizzie (Pride & Prejudice, 2005). He is rejected, and Lizzie makes her exit across the Palladian Bridge. The famous garden was created in the 18th century to resemble a painting by Claude Lorraine. A walk winds around an artificial lake, passing romantic ruins, a grotto, temples etc. Wandering the grounds will make you feel like a heroine in a Gothic novel. Welcome to Pemberley! The exterior of Lyme Park became famous as the home of Mr Darcy in Pride and Prejudice (1995). Please note: ‚Darcy’s pond’, where the famous wet shirt scene was shot, is not the lake behind the house. ‚Darcy’s pond’, however, is on the estate, and you can go there if you don’t mind a little walk. The gardens are especially lovely in May when the rhododendrons are in bloom. Besides, Lyme Park has its own Austenesque story to tell. Read more about a scandalous abduction in the early 19th century here. The Elizabethan Mansion serves as a very grand ‚Rosings Park’ in the sumptuous Pride and Prejudice adaptation of 2005. Both exterior and interior were used as settings. The Heaven Room and the Bow Room, where Lady Catherine de Bourgh entertains her guests, are lavishly painted. Burghley House’s painted walls and ceilings dazzle the eye, and if you are into art, the large picture collection will be an extra treat. Are you a romantic? You might enjoy the story of the heir who married the daughter of local farmer in the 18th century. The other Pemberley: In Pride and Prejudice (2005), Lizzie wanders through the rooms of Mr Darcy’s family seat in awe. Nothing could suit this scene better than the grandeur of Chatsworth. Follow in Lizzie’s footsteps and explore the marble statues in the gallery. Chatsworth is one of the grandest houses in the country, and its history matches its splendour. You might want to study the life of famed-famous Georgiana, Duchess of Devonshire, when you visit the estate. When it comes to the adaptation of Sense and Sensibility, you can’t beat the movie of 1995 with Hugh Grant, Alan Rickman, Kate Winslet, and Emma Thompson. Beautiful Saltram House featured as ‚Norland Park‘, the cherished home Elinor and Marianne had to given up to live a modest life among strangers. Saltram House has real connections to Jane Austen. The Countess of Morely, Frances Talbot, who lived at Saltram House, used to correspondent with Jane Austen around 1815. Reputedly, Jane Austen sent a copy of her novel „Emma“ to the countess. In the early 19th century, some people believed that the Countess, being a witty and literate woman, was the authoress of „Sense and Sensibility“ and „Pride and Prejudice“. At ‚Netherfield Park’, Lizzie and Jane get to know their new neighbours better: Amiable Mr Bingley, his haughty sister and proud Mr Darcy. 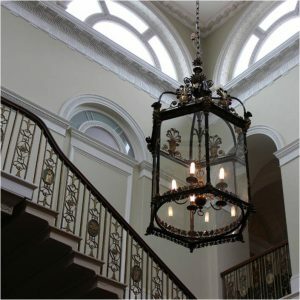 For the 2005 adaption of Pride and Prejudice, Basildon Park featured as ‚Netherfield’ – a good choice, as the country house has an ‚Octagon Room’ that perfectly suits the famous scene where Miss Bingley and Lizzie walk around a room, mocking Mr Darcy and trying to get his attention. 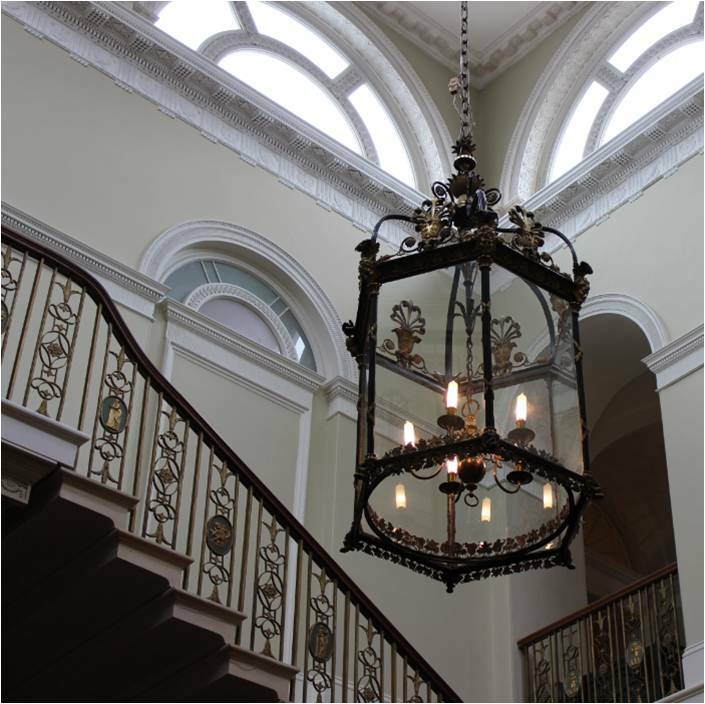 The beautiful Great Staircase of Basildon Park is also part of the setting. Basildon Park was built when Jane Austen was a child, but the house was never fully completed. It owns today’s look to a rich couple who restored it after WWII. Basildon Park reached plenty of fame as a film location, lately as ‚Grantham House’, the town house of the Crawley family of the 2013 Christmas Special of Downton Abbey. Basildon Park owns a letter of thanks written by Matthew Macfadyen, and some props used for Pride and Prejudice (2005). In Mansfield Park (1999), Kenwood House is ‚Sotherton Court’, home of James Rushworth (perfectly portrayed by Hugh Bonneville). In her novel, Jane Austen described ‚Sotherton Court’ as a noble and old place. In the novel, this is where Maria Bertram’s affair with Henry Crawford begins. In the movie, ‚Sotherton Court’ is hardly in view for 10 seconds. So why go there, you might ask. Because there is lot of Jane-Austen-era history here. Kenwood House was owned by the real Lord Mansfield in the 18th century. He was the most powerful jurist of the century, and his decisions moved England on the path to abolishing slavery and the slave trade. Lord Mansfield and his wife never had children of their own, but they did take in two daughters of nephews: Lady Elizabeth Murray and Dido Belle. The latter was the daughter of an enslaved West Indian woman and Lord Mansfield’s nephew Sir John Lindsay. Dido Belle was brought up as a gentlewoman at Kenwood House. Her life became the subject of the movie Belle (2013). We can be certain that most persons in late 18th century knew the name of Lord Mansfield, and his contribution to the abolition of the slave trade. Thus, Jane Austen was very likely inspired by him and his family when she wrote „Mansfield Park”. Newby Hall‘s interiors and the beautiful grounds were the ideal settings for the 2007’s adaptation of Mansfield Park. The film was entirely shot at Newby Hall. Try and find the family portraits, the drawing room and the dining room familiar from TV. If you enjoyed the TV series Downton Abbey, you might find it amusing that a real Lord Grantham once owned Newby Hall. He even had a daughter named Mary. She inherited Newby Hall on marriage. Whether Newby Hall inspired Julian Fellows to create Downton Abbey or not, this splendid house designed by Robert Adam is well worth a visit. The gardens are stunning, and there is a dollhouse exhibition with more than 70 houses, most of them in historic style (find out here why dollhouses are cool). Claydon House is ‚Donwell Abbey‘ in Emma (1996). Here, Mr Elton snubs Miss Smith, and Mr Knightly come to her rescue. Gwyneth Paltrow as Emma and Jeremy Northam as Mr Knightley most elegantly perform the dance ‚Mr Beveridge’s Maggot‘. This dance also features in Pride & Prejudice (1995) and has by now become the most famous dance of the Jane Austen adaptations. The ball room scene was shot in the North Hall, so bring 3 friends and take your chance to dance ‚Mr Beveridge Maggot’s‘ in a real Jane Austen movie location. Claydon House is tucked away in rural Buckinghamshire. Its interior reminds one of a cake with rich icing. The tea room in the courtyard will allow you to explore this thought further. For Sense & Sensibility (2008), scenes at ‚Allenham Court‘ were shot at Dyrham Park. Allenham Court is the home of Mrs Smith, the wealthy aunt of Mr Willoughby. Mr Willoughby visits her, gets to know Marianne, and the drama unfolds. Willoughby kisses Marianne for the first time at their visit at ‚Allenham Court‘. Dyrham Park is noted for its art works and furniture from Holland, and a large collection of Dutch Masters. One the lighter side, there is information about the language of the fan in one of the rooms, so why not bringing a fan and practising flirting in 18th-century style? Ham House serves as ‚Norland Park‘ for both interior shots and some exterior scenes in Sense and Sensibility (2008). The house also featured as ‚Cleveland’, the home of the Palmers (a feather-brained couple, but considerate toward the Dashwood sisters). Scenes shot at Ham House include the one when Marianne is saved by Colonel Brandon. During the Civil War in the 17th century, a daughter of Ham House, Elizabeth Murray, worked as a double agent: She established good relations with Oliver Cromwell and his Parliamentary supporters, while sending secret messages to the exiled Charles II. The King was grateful: When the monarchy was restored in 1660, Elizabeth was made owner of Ham House in her own right. Her home quickly became known for its extravagant furnishing and entertaining. This entry was posted in First-hand experience. Bookmark the permalink. ← What happened 200 and 250 years ago?